BRINK’S MACHINE CO. offers a “Tooling Management Program” (TMP) that will save your Company, time and money. Ø Save money by not having to Stock large quantities of “Spare Tooling”, “Details” etc. on your shelves. Let BRINK’S MACHINE CO. stock your “Spare Tooling” details and you only pay for them as you receive them. 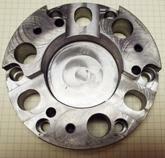 Ø Save time by helping to reduce “downtime” caused by the lack of “Spare Tooling” in your “crib”. BRINK’S MACHINE CO. will stock, on our shelves, a 90-180 day supply of each of your items for immediate delivery upon your request. The BRINK’S MACHINE CO. TMP is quick and easy to set up and will start saving your Company time and money immediately. Send us your detail part prints. We will return a quotation based on projected annual requirements for each item and will be reviewed, and adjusted if necessary, on an annual basis.